Madrid has something for everyone to enjoy and discover as they stroll the elegant boulevards with plaza's and parks around every other corner, taste the tapas, and dive into the cities culture. A hop-on-hop-off bus tour gives a great introduction to the city and allows visitors hassle-free transport around all the top attractions whilst those who are feeling more energetic can enjoy a city cycling tour. Art lovers will want to head straight to The Golden Triangle of Art which comprises 3 prestigious museums containing some of Europe's most important paintings from some of the top masters. Those seeking to immerse themselves in the Spanish culture can enjoy an evening of traditional flamenco. 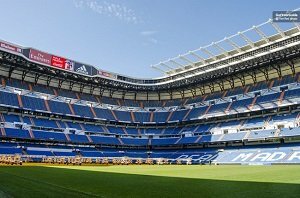 Sports fans will want to see inside the Real Madrid FC Bernabeu stadium whilst history and architecture lovers are going to be thrilled when they visit the nearby UNESCO world heritage cities of Toledo, Segovia, and Avila on a coach trip. 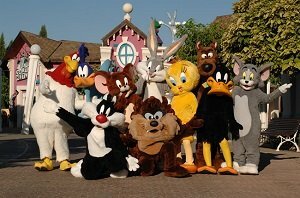 It's not just about culture though, let your hair down for the day at Parque Warner and enjoy the roller coaster rides as you take selfies with your favourite Looney Tunes characters. To help you get the most from your visit to Madrid we have done the research for you, hand-picking the top-rated attractions and tours, comparing the prices, reading the reviews and compiling all the tips and information you need to know. So just sit back, sip the sangria, taste the tapas and say Hola to Madrid! 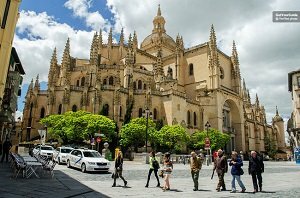 A tour to Segovia and Avila from Madrid. See the main sites of these 2 World Heritage cities in 1 day. A guide will accompany you on the coach and guide you through the city streets and around the top attractions. Visit Avila, one of the oldest cities in Spain. Visit Segovia with its majestic Roman aqueduct. Learn the history of these two historic cities from a knowledgeable guide. Air-conditioned coach to Avila and Segovia with return travel to Madrid. Fast-Track entrance fees to the selected attractions are included. A professional and knowledgeable guide including commentary onboard the bus. Gaining 4 and 4.5 stars out of 5 this trip has received a ton of positive reviews from happy travellers. People say that the tour guide is experienced and manages the time in these 2 cities well. They describe it as 'A Superb Day', Great Trip, Would Highly Recommend It' and 'An Easy Way To See The Sights'. Perfect for visitors to Madrid who wish to discover more of Spain. A tour guide with you at all times so no chance of you getting lost in the backstreets! Learn all about these historic cities and gain insider knowledge on the attractions you'll see. A 7 hour long guided tour of Madrid's 3 best art museum's; The Reina Sofia, The Prado, and The Thyssen. Take in the top paintings and sculptures in Madrid's top art museums in 1 just day. Learn about the most important artworks and the artists who painted them from an art historian guide. Visit The Reina Sofia Museum, The Prado Museum, and The Thyssen Museum. See Las Meninas by Velázquez, View The Dauphin's Treasure, see Picasso's famous anti-war oil painting, 'La Guernica', Dali's 'Enigma of Hitler', and works of art by other famous names including Raphael, Titian, Rembrandt, Van Gogh and many more. Marvel at all the wonderful art these 3 museums contain as you learn about the artists, the paintings, and how each museum came to be. Skip-the-line entrance into The Prado Museum, The Reina Sofia Museum and The Thyssen Museum. A guided tour taking in the highlights of the museums given by a bilingual guide. On both Viator and Tripadvisor visitors have given this tour top marks with 5/5. People are very happy with the tour saying that the guide is very knowledgeable as well as friendly. Travellers report that they thought the trip was good value for money. Perfect for people who are short on time but want to see the highlights of all 3 museums in 1 day. Great for art-loving adults but the kids will be kept entertained too. You need to walk between the 3 different venues, as well as around the museums so make sure you have your walking legs on! 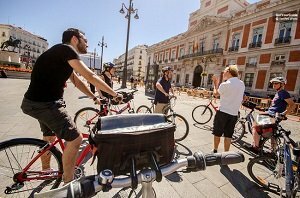 A 3 hour city cycling tour around Madrid. Cycle past the top scenic sites in the city on a group tour. Hear about the attractions you're passing from a friendly bilingual guide. Get collected from your hotel and travel together to collect the bikes. See the Templo de Debod, the Cathedral of La Almudena, the Plaza de la Villa, the Plaza Mayor, Retiro Park, and the Plaza de España. Stop for a coffee break half way through the tour. A guide who speaks your chosen language. Photos of your cycling adventure sent to your inbox after the tour. This cycling tour gets near top marks, the vast majority of participants being very happy and strongly recommending the tour to others. Some travellers say that the tour has easy biking, even for novices, yet other report disliking cycling on busy city roads. The tour guides are friendly and the majority of people agree that this is a great way to see Madrid. If you dislike walking but love cycling this city sightseeing tour is made for you! You'll feel safer and more comfortable and confident if you're used to riding on city roads. Suitable for families with kids over 12 years of age, though some tour operators will adapt the tour to cater for those as young as 8 years old. 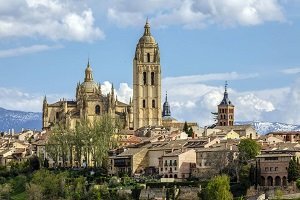 A full day coach trip with guide to see the main attractions in the picturesque cities of Toledo and Segovia. Toledo is a UNESCO world heritage site. The picturesque medieval city has narrow streets, historical bridges and city walls to explore. Segovia is an equally picturesque and historically important city. Enjoy a walking tour along the charming streets before stopping to view the Alcazar, Cathedral and Aqueduct . Stop at the Mirador del Valle in Toledo to see the medieval town laid out in front of you – The perfect place to take photos! Visit the Cathedral of Toledo, the Monastery of San Juan de los Reyes and the Puente de San Martin. Leaving Toledo, you'll make your way to Segovia where you will visit the breathtaking Alcazar, see the aqueduct and visit the cathedral. Entrance fee to the Alcazar in Segovia. A bilingual (English and Spanish) guide. Return travel from Madrid on an air-conditioned bus or coach. Travellers describe this trip as 'Amazing', 'A Must-Do When In Madrid'. This trip has top reviews from the majority of travellers who say the guide was friendly and the trip well organized. The trip is said to be good value for money and is highly recommended. Perfect if you don't have much time but want to see more of Spain than just Madrid. Culture vultures who love history and architecture as well as photographers will enjoy this trip. A must-do if you enjoy learning about places with a guide on-hand to answer all your questions. Fast-track entry into Madrid's National Art Museum. Full-day entry including access to the temporary exhibitions. Over 1,500 of Europe's best paintings, drawings, and sculptures to be enjoyed. Discover Spanish and other European works of art dating from the 15th to the 19th centuries including works by Picasso, Dali and Van Gogh. View the Royal Dauphin's Treasure. View the sculpture collection which contains more than 900 pieces. 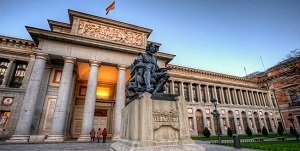 A full-day ticket to see the works in the world-renowned Prado Museum. No need to queue at the ticket office! 94% of visitors rate this museum as either Excellent or Very Good. They describe the museum as 'Spectacular' saying this museum is one of the best in the world. Visitors highly recommend spending a whole day here to see everything the museum has to offer. 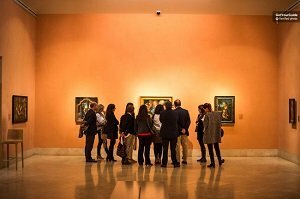 A must-do for art lovers visiting Madrid! Skip-the-line is great for visitors who want to maximise their time inside the museum. A general entrance ticket for a fun-filled day at the Warner Brothers theme park in Madrid. Meet your favourite cartoon characters and ride on all the roller coasters and other rides. Splash around in the water parks and enjoy the live-action shows and other entertainment. Depart Madrid at 10.30am on an air-conditioned coach to the theme park. Enter the park using the fast-track lane and enjoy a full-day of Warner Brothers rides and entertainment. Leave the park at 9pm, 10pm or 11pm (depending on park closing time) and return to central Madrid via coach. Access to all the rides and shows. Families have had a fantastic time at Parque Warner describing it as 'Enjoyable For All Ages'. On Tripadvisor, visitors describe their visit as 'A Blast' and say it's similar to Disney but instead of finding Mickey Mouse on the street you find Batman and Superman! Many tripadvisor reviewers have either been more than once, or would like to go back again. A must-do if you have children and are visiting Madrid for a few days. Rides suitable just for adults, just for kids, and the whole family together. A top place to visit for roller coaster enthusiasts! 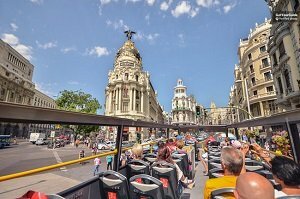 A hop-on-hop-off city sightseeing bus tour with 2 interconnecting routes allowing you to easily see, and reach, all of the top sites in Madrid. Travel on a comfortable open-top double-decker bus with multilingual audio commentary. With your 1 or 2 day ticket you're able to get on and off the bus as many times as you like, alternatively stay onboard for the entire loop. Board the bus at any of the 37 bus stops and travel between the most popular sites. Learn about the sites you're passing with the audio commentary. Pass by The Royal Palace, The Cathedral, Gran Via, Real Madrid FC stadium and so much more. A 1 or 2 day ticket allowing travel 2 routes around Madrid. Multilingual commentary via headphones - 14 languages are available. You'll receive a map of the city and discount vouchers for shops and restaurants. This tour has a 4.5-star ranking on TripAdvisor. Travellers describe this tour as a great way to see the city. Sitting on the top level enables great photo opportunities. Travellers recommend doing the Blue Line tour 1 day, and the Green Line tour the next day. An excellent way to get acquainted with the city in a short amount of time. Quickly and easily reach all of the top sites in Madrid. Great if you don't want to walk far! Priority entrance to Real Madrid FC Bernabéu Stadium. Learn about the history of Real Madrid football club and its players in the on-site interactive museum. Go behind the scenes with access to player exclusive areas. Explore the stadium at your own pace. Visit the on-site museum to learn about the history of Real Madrid FC. Go behind the scenes with access to exclusive areas including the trophy room, changing rooms and players tunnel. A panoramic view of the stadium including the chance to walk the perimeter of the pitch, sit on the bench and view the training area. A visit to the Presidential Box, usually reserved for VIP's only! Re-live iconic moments in the clubs history on pitch-side video screens. On Viator, visitors report this tour as being 'Fabulous', 'Simply Awesome', and 'Very Enjoyable'. Even non-football fans say they found it surprisingly interesting and a great day out! One avid Real Madrid fan says that the access to exclusive areas can turn dreams into reality. A must for any football fan, but particularly those who support Real Madrid. Great if you've been to the stadium in the past to watch a game and now want to see behind the scenes. Even non-football fans will find this tour interesting. Skip the line with a 1.5 hour guided tour around the famous Reina Sofia National Art Museum in Madrid. View 20th Spanish art inside this historic 18th century building, a former-hospital. Although primarily known for its paintings, the museum also has an impressive collection of sculptures. See paintings by Picasso, Dalí, Miró and more. Enjoy a guided tour in English and Spanish. Free-time to explore the museum at your own pace after the guided tour. A guided tour by a bilingual art historian lasting 1/5 hours. Skip-the-line admission, no need to queue at the ticket office. 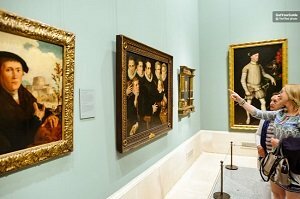 All-day access to both permanent and temporary exhibitions. More than half of Tripadvisor reviewers give this museum an 'Excellent' rating. People say this is a must-do when you visit Madrid, visit to see Picasso's Guernica. People have described the Reina Sofia museum as 'Almost Overwhelming' due to its vast size, saying it's a 'Wonderful Collection In An Interesting Building. If you are a lover of the Spanish masters this is the museum for you! Visit if you want to see Picasso's world-famous painting 'La Guernica' – The museum's star piece! Perfect if you want to learn about the artists and paintings as you go around the museum. Entrance into the Museo Nacional Thyssen-Bornemisza in Madrid. One of the largest private art collections in the world showcasing artworks from the 13th century to the 20th century plus jewellery and fashion exhibitions. The Thyssen museum is part of Madrid's 'Golden Triangle of Art'. 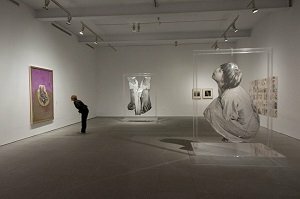 View the permanent and temporary exhibitions at the Museo Nacional Thyssen-Bornemisza boasting nearly 1,000 works of art. View paintings from the masters including Raphael, Titian, Rubens, Rembrandt, Caravaggio, Manet, Renoir, Cézanne, Van Gogh, Gauguin, and Picasso. Discover the history of gems and jewelry collection and walk back in time through the fashion exhibition. General entry into the permanent collections of the museum with fast-track entry into the museum. Timed entry into the temporary exhibitions. Self-guided tour of the museum with audio tour available. 70% of TripAdvisor reviewers rated this art museum as Excellent. Visitors have described it as 'An Art Lover's Paradise' and 'One Of The Most Beautiful and Richest Collections In The World. Visitors to the museum have been thoroughly impressed with the private collection of works, saying the pieces are varied and carefully selected. Art lovers of all ages will adore this museum. Perfect if you want to visit an art museum in a couple of hours and don't have time to explore the vast Prado Museum which requires a full-day. Fashionista's will enjoy the add-on exhibitions showing jewellery, gems, and fashion through the ages. A half-day (5 hour) tour to the UNESCO World Heritage City of Toledo. 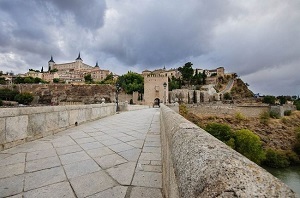 Toledo is a picturesque medieval city that has narrow streets, historical bridges, churches and city walls to explore. Enjoy a morning or an afternoon tour with a bilingual guide as you discover 'the city of 3 cultures'. Walk the medieval streets of Toledo and visit some of the key attractions including the Santa María La Blanca Synagogue. Learn the history of this beautiful city as you tour the Jewish quarter. Enjoy panoramic views from the bus as you journey around the outside of the city walls. Fast-track entrance fees for the planned sites and attractions. A guided tour of Toledo streets plus bus tour around the edge of the city. Return transport from Madrid by air-conditioned coach. This tour has been well received by travellers, the majority giving it 4 or 5 stars. It has been described as 'A well organised tour with friendly informative guide'. Others have said 'A short but amazing tour of Toledo'. A good introduction to the historic city of Toledo. Good if you enjoy guided tours and learning facts and history about the places you see. Great if you want to see somewhere else in Spain other than Madrid but don't have much time. 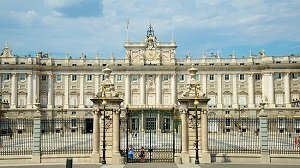 A 90 minute guided tour with fast-track entry into Madrid's Royal Palace. See inside the largest Royal Residence in Europe. Marvel at the sumptuously designed and decorated rooms, halls and galleries. See the Throne Hall, Royal Armories, Hall of Halberdiers, Painting Gallery, Kitchen, and so much more! Learn about the history of Spain and the Spanish Royal Family. Enjoy fantastic city views from the upper levels of the Palace. A 90 minute guided tour inside the Royal Palace. with a knowledgeable local guide. Information from a local guide fluent in English and Spanish. Fast-track entry included in the ticket price. This tour receives fantastic reviews on Tripadvisor with visitors saying it's a 'Must Visit' and 'A Top 10 When In Madrid'. It consistently receives 4* or 5* reviews on Getyourguide. People say that it's a very interesting tour with a nice knowledgeable guide. A must-do if you're a culture vulture who loves history and stately homes. The guided tour gives you insightful information that you may not otherwise learn. A great tour for the whole family. See a live flamenco show at the legendary Tablao Torres Bermejas venue. Said to be the most important and unique flamenco show in the world. An unforgettable experience of dancing and décor lasting 1.5 hours. Enjoy an evening watching Cuadro Flamenco performed by the best dancers and singers. Delight in the Arabic décor that imitates Granada's Alhambra. Dine on delicious tapas when booking the meal ticket. Live music and live show. A free drink while you watch the show. An additional dinner option is available where you'll be served a traditional Spanish tapas meal. Everyone loved the ambience of this place and said the dancing was great. People have said it is 'An intensive and professional show' and 'One of the best in Madrid'. People say that the time flew by and the location was super easy to find. A must if you want to see the most unique flamenco show not just in Madrid but in the world. A romantic evening, perfect for couples. 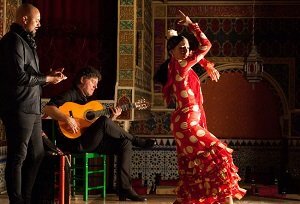 Immerse yourself into traditional Spanish culture for an evening and tap your feet to the rhythm. 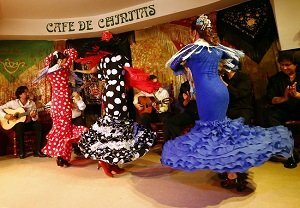 Watch a traditional Andalucía flamenco show at Café de Chinitas. An energetic performance where flamenco artists present and perform their own choreography. 2 performance times to choose from: 8pm or 10pm. Watch the show and enjoy a drink of sangria or other beverage of your choice. Enjoy the Alhambra inspired surroundings with beautiful Arab style tiles. Become spellbound by the energetic performance put on by an internationally renowned group of flamenco artists. Entrance to the flamenco show. A drink of your choice. An energetic performance that you won't forget. This show consistently receives 4 and 5 stars from happy visitors. People say that it's an absolutely fantastic show with passionate performers in an intimate setting. Reviewers highly recommend the show to others. A must-see if you want to experience the traditional Spanish dance. Enjoy a traditional Spanish night out with passionate performers. Perfect for couples who want to enjoy a romantic evening as well as groups. A convenient and affordable way to visit Madrid's top tourist attractions. One ticket to gain entry to your choice of 3, 5, or all 26 listed activities. Visit museums and attractions, go on guided tours, bus tours and more. Choose the 3, 5, or 26 options you want to see/do in Madrid from a total of 26 top activities. Save time and money as you enjoy fast-track entry and special discounts. Also save money on car and bike rentals and at selected bars/restaurants. Fast track entry into a choice of 26 attractions. Free drink from selected venues. Valid for 7 consecutive days from the time of activation. Travellers give this card between 3.5 and 5 stars and highly recommend it for saving time and money when sightseeing in Madrid. 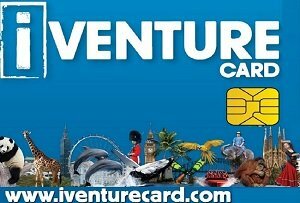 If you know you'll be visiting a lot of paid-for museums and attractions when visiting Madrid, the iVenture card can work out cheaper than paying for each ticket individually. Quick and hassle free – Avoid ticket office queuing times and enjoy the convenience of entry to multiple attractions with just 1 ticket. A great way to save money not just on attractions but restaurants and rentals too.